Named after the only gap in the north-south Oregon Coast Mountain Range, the Van Duzer Corridor, Van Duzer Vineyards has achieved impressive success of late under the direction of winemaker Florent “Flo” Merlier. Flo is a native of Burgundy, France, who has a Diploma in Viticulture from the University of Dijon. 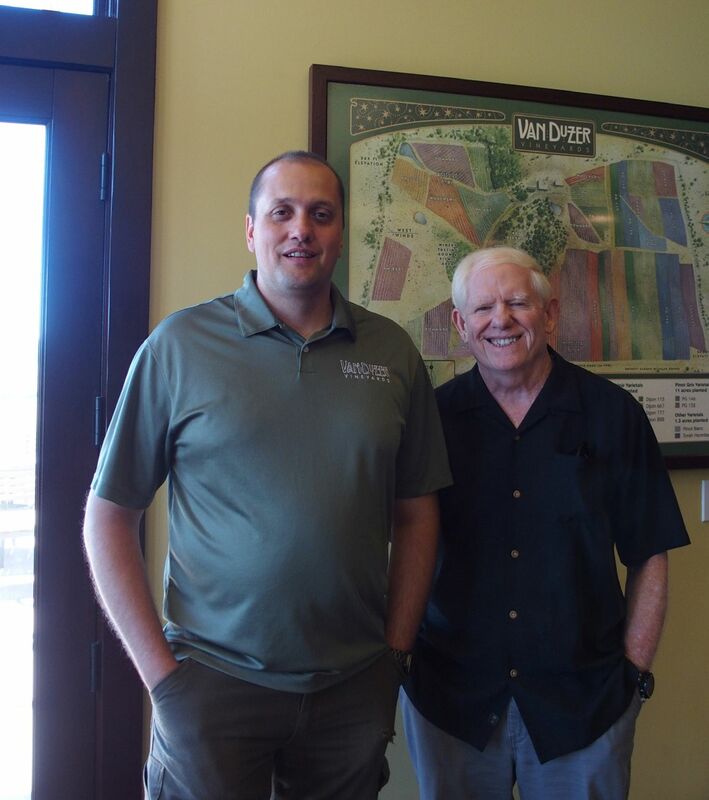 He relocated to the United States in 2009, and joined Van Duzer Vineyards as winemaker with the 2011 vintage. With his efforts, Van Duzer wines have now reached the upper echelon among Willamette Valley wineries. Flo and I are pictured below on my recent visit. Van Duzer Vineyards is located 60 miles south of Portland and west of the Eola Hills and Salem in Dallas. Because the vineyards are in the eastern mouth of the Van Duzer Corridor, summer temperatures drop sooner in the afternoon than in the vineyards to the North or south by 13 degrees, resulting in extended hang time. The estate vineyards total 82 acres including Pommard, Wädenswil, and Dijon clones of Pinot Noir and Pinot Gris plantings. There are a number of new achievements since I last wrote about this winery in 2014: www.princeofpinot.com.article/1535/. A new label has been designed, a new estate vineyard is being developed in the Dundee Hills, and the winery now produces a Pinot Blanc and Chardonnay to accompany its other offerings. The picturesque hospitality center, only a 20 minute drive south of McMinnville, is open for wine tasting daily. Visit the website at www.vanduzer.com. Most of the wines I tasted in July have not been released so I don’t have complete data and prices on all wines.